Community Meals with the Hari Krishna	Temple | Jai!! 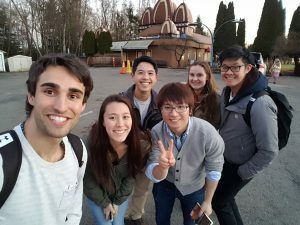 Since January 2017 our team has had the challenge and opportunity of discovering what role the Burnaby Hare Krishna Temple (BHKT) plays in food security. Specifically, we learned that the Bhakti Yoga faith of compassion and service motivates the Krishnas to share community meals both as a way to build community, serve food and expand membership. The Temple provides a safe place to connect, worship and celebrate for anyone. Our findings suggest the BHKT has a valuable role as a faith based organization improving access to nutritious food in their region. Going forward we believe increased collaboration between UBC and BHKT could lead to more effective results in addressing food security. Hare Krishna faith comes from Bhakti Yoga, the yoga of love and devotion. One common experience that all of our group members had was getting a deeper understanding of our course material after connecting it to real life experiences. We learned new theories, concepts and ideas through lectures and readings as well as through collaboration with our community partners. The AER papers, final report and infographic gave us further opportunities to make connections between each other’s experience which helped us create ideas that are both convincing to others as well as to ourselves. These connections we not easy to spot and discern, as we quickly found out, as everything is so tightly intermingled with each other. However, though piecing together many parts, we received more knowledge than any textbook could ever offer. As beautiful as UBC, is getting off campus and into the community greatly enhanced our learning. For example, Kentaro and Sarah went to the Hare Krishna Temple’s Annual Festival to experience first hand what their community celebrations were like. They talked to members that were attending the festival who cared about food security, with some who run their own food kitchens located in the Downtown Eastside. Learning about food security in class helped Kentaro and Sarah appreciate the Hare Krishna’s belief of feeding the world with healthy vegetarian food. Alysha learned from talking with Temple authorities that faith can play a huge role in dictating overall diet in a very positive way. Krishna faith firmly believes in not only following a sustainable vegetarian diet, but also in providing food for others (J. G. Dasa, personal communication, January, 2017). Understanding this can help bring to light potential opportunities for future collaborations with a common goal of increasing food accessibility for local communities in a sustainable way. Similarly, Marcus’ experience two years ago in Uganda working with a community microfinance organizations allowed him to explore and experience Mathie and Cunningham’s (2003) concept of asset-based community development. He was able to see the strengths and potential that members of the local community have in providing for their individual wellbeing as well as for the wellbeing of their community. This experience was similar to the experience of visiting the the Hare Krishna Temple in that he was able to use an experiential learning approach to understand what cannot necessarily be described in words about a community. Jaidan experienced his first community partner on his trip to the Hare Krishna Temple. Listening to the beliefs and principles from the Hare Krishna devotees has opened a new world filled with a vibrant array of culture. 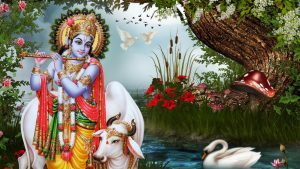 Before he visited the temple he knew some very basic knowledge about Hare Krishna faith, such as they are a branch of Hinduism and they consider cows special, however after visiting the Temple, he learned much more. Learning about the history and practices of why Hare Krishna offers food supported the ideas of food security that were discussed in class (J. G. Dasa, personal communication, January, 2017). Through understanding who the Hare Krishna are and what they can offer, we’re starting the first steps in building a partnership for a more food secure world and taking that first step is always the most important part in starting any endeavor. For Timerlane, upon returning from India January 2nd and within a week of return receiving placement in the Hare Krishna Temple astounded him. Timerlane has been most amazed at how similar the Temple he visited in Rishikesh India is to to the Temple in Burnaby. Timerlane believes this similarity is a testament to the quality of community in the global network of Hare Krishna Temples. Hare Krishna faith follows Bhakti Yoga, the Yoga of Love and Devotion (J. G. Dasa, personal communication, January, 2017). Like his experience in India, Timerlane has seen how his experience with Burnaby Hare Krishna have informed his leadership. Much like Olsen (2014), Timerlane suggests yoga is a powerful tool for enhancing leadership with its focus on systems thinking and service to the world, as illustrated by the Hare Krishna. Olsen (2014) goes on to highlight self knowledge, community, and health as major components of how yoga can enhance leadership. Timerlane looks to use this LFS 350 experience and research such as Olsen (2014) to inform his growing consulting and coaching business. As the Krishna’s taught us, Yoga is not just physical, it is also mental, emotional, spiritual, and philosophical. These aspects (Olsen 2014) help build better leaders and better communities. Most classes in UBC are lecture based where much of the learning is passive. We take notes, do practice problems and take exams. However, knowledge gained this way is often not practical in real life situations. One experience that Kentaro had that demonstrated this was when he went to an alumni event while he was looking for colleges during high school. He asked some of his high school alumni who were already working professionally, “how useful is the knowledge you gained during University for your job now?” What followed was silence with all the alumni looking at each other hoping someone else would answer. The knowledge gained through these countless lectures and readings are fully utilized once it is put into real life scenarios accompanied by first hand experiences. Shulman (2005) claims that learning for the sake of knowledge is not sufficient, we need to learn in order to be able to use it. We think one large aspect of LFS 350 is bridging the gap between academic knowledge and real life. As Will Valley (2017) puts it, being knowledgeable vs knowledge- able. We learn about different theories such as food security, food sovereignty and systems thinking, but we are also thrust into a world where these theories are relevant and intertwined. Our team unanimously agreed that this course has helped enhance our professional skills and application of lecture material making us more employable and better qualified to fulfill our future career endeavors. Once we enter the professional world, our work environments are full of uncertainty (Shulman, 2005). Many of the ideas we learn in class may not apply cleanly to real life problems. 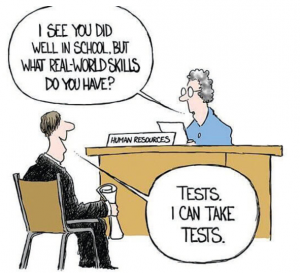 This should not discourage learning but should be seen as an opportunity where further learning can occur. Regardless of the field we decide to go into, we need to strive to be a person who can make responsible decisions under uncertainty by using both academic theory and personal experience. After LFS 350, we should continue to seek experiences that connect abstract theories that we learn in class with concrete experiences. We should reflect upon these experiences and see what areas we can still enhance our knowledge on. By engaging in the process of self awareness, action, reflection, and adaptation we help to ensure our continued growth and success. This process has a synergizing effect of helping us in the real world by letting us make better decisions as well as in academics by giving us motivation to learn more. With this competitive job market, someone who just passively learned and got a degree for the sake of knowledge will have a lower chance of getting a job. To continue to consolidate and expand on our learnings we will continue to experience a great variety of challenges, circumstances, and environments to build connections between abstract theories and concrete experiences. More of our team is nearing the last year or two of their degrees, so continuing to prepare for further academia or professional career development is crucial. Our team is full of passion and enthusiasm, diverse interests, and a commitment to living the best life we can possibly live that includes adventure, growth, connection, contribution and meaning. We will take the inspiration and learnings from this course wherever we go and use them in the most constructive ways possible. Our team feels inspired to use this experience to inform our career development and live life on our own terms. In this blog entry we highlighted the key takeaways from our project and shared our major reflections in a what, so what, now what fashion. Our project has been an overall success; we have achieved our initial objective of learning about the value of the BHKT in relation to food security and we have found they do have a valuable role to play through their community meal programs. Furthermore, their role could be enhanced through collaborations with organizations like UBC and other faith-based organizations. Our team reflected on our LFS 350 time and found the most valuable component of the course is the opportunity to apply our course theory and engage in the community in a professional manner. Going forward we aspire to take what we have learned to better prepare us for the professional world. Continuously learning, reflecting, and putting ourselves in meaningful challenging new situations is key to support our continual growth. Lastly, we end with a note of gratitude and appreciation for this opportunity and look forward with enthusiasm to closing this LFS chapter and starting a new one. Olsen, P. (2014). 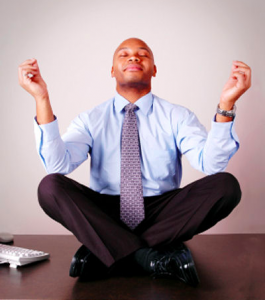 Namaste: How Yoga Can Inform Leadership Education. Journal of Leadership Education. This entry was posted in Uncategorized on April 2, 2017 by Sarah Beaver. Did you know: A university student’s mental wellbeing can be determined by the grades received on assignments and projects? This week we have set up multiple goals in order to set our group up for future success. 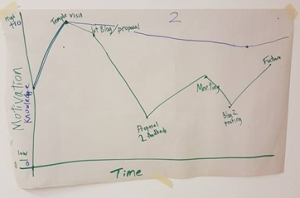 In the short-term, we will be editing the second draft of our blog post 2 to enhance its fluidity, reader engagement (through the use of a hook) and visuals aesthetics. As well, we have created a schedule for blog 3’s completion and intend on delegating roles for its optimization. For the long-term, we have begun to look into the criteria for the infographic and final report as it will help us identify the current major gaps within our project. We’re planning on using these identified gaps to work backwards from the final report in order to identify ways to fill these gaps. For example, perhaps we need to consider additional site visits with our community partner to be prepared to address these gaps or look towards academic literature for insight. It has been a week full of activities and progress for our LFS 350 project. We completed our class assignments consisting of our 2 blog submission as well as the academic and experiential review paper thesis statement. In addition, the majority of our group was able to visit the Temple to conduct an interview with Jaya Govinda, a member of the Hare Krishna Temple, and another devotee. This was extremely helpful as it increased our understanding of the Temple by solidifying information that we can incorporate into our final report and infographic. It was at this meeting that we were able to help clarify with Jaya Govinda the intent of our group project as it has changed over the past few weeks with the revision of our proposal. Lastly, we were able to meet as a whole team to debrief the second visit to the Hare Krishna Temple as well as appropriate steps in moving forward. This is an important achievement for our group as one of the objective that we had set in the previous week was to meet as a team to help with the team communication, and we have done so! An investigation of our motivation and knowledge throughout the semester was conducted through a reflective activity within our tutorial session. This activity allowed us to reflect on our individual understanding of our own feelings as well as those as an entire group. What – In terms of our group knowledge, we feel that there has been a slow decline as the project went on. This mainly stems from the fact that as we learned more about the project, the larger its scope became resulting in many more questions and uncertainty. These feelings of uncertainty began to snowball, leading to an ever growing number of questions. However, we are optimistic about this in that we are beginning to see a slowly increase in our ability to to see interconnections between Hari Krishna faith, food and provision of community meals as we continue to do our research on the Temple. After all, “in the presence of uncertainty, one is obligated to learn from experience” (Shulman, 2005) and find ways to fill in these knowledge gaps. Figure 1: Graph of motivation (green) and knowledge (blue). In terms of our motivation, we noticed that it peaked with our first visit to the Temple. This is because we had learned a lot, began to form a relationship with the members of the community, and had an idea of the direction our project could take in regards to the onsite gardens they posses. It is important to us to keep the motivation of our group on the positive side, however our motivation then fell slightly after submitting our first blog post due to the feedback we received in combination with the difficulties we experienced in coordinating a blog post with so many diverse voices. Our motivation then further declined after submitting and receiving feedback on our project proposal. We had thought that we had produced a high degree of quality in our proposal and were initially confused as to why that was not being reflected in the feedback we received. We decided to seek help by talking with our TA Colin and he provided much more clarity as where the score of our project should be focused reigniting our motivation. 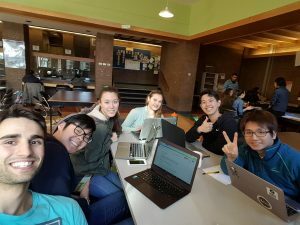 Although our understanding of the project motivated us, the challenges associated with any group collaboration regarding communication made the second blog difficult to complete and dropped our motivation slightly again. But now after going to our 2nd visit to the Temple and discussing as a whole group, we feel as though our motivation is increasing and hopefully will continue to do so through to the end of the term. So What – Every time our motivation drops, or our perceived amount of knowledge we have on that subject drops, we gain various skills such as teamwork, communication, time management and an overall professionalism that will be needed when we enter the workforce. Facing these disenchanting moments may cause anxiety and stress, but as Shulman (2005) emphasizes “ without a certain amount of anxiety and risk, there’s a limit to how much learning occurs.” Full certainty can be pursued in classes such as mathematics, where there is one correct answer, but as professionals we will need to be able to make decisions under circumstances when they are various answers causing lots of uncertainty. Being able to make good responsible decisions under these conditions is perhaps the most valuable skill that this course is teaching us (Shulman, 2005). Now What – There are three main strategies that our group has agreed to implement for the successful completion of our project. Taking the steps to complete the project will hopefully lead us to a successful end product. Understanding and integrating our objectives. Much has changed through this course on the direction of our project and it is key for our success that we have a clear understanding of our objectives. These objectives will come into play when we are composing our final report and infographic. We need to truly understand the objectives that we have come up with in the beginning and how we have to alter them going forward. Integration of academic sources. We have obtained much information regarding the Temple through interviews and site observations. We are now looking towards integrating this information with academic sources to understand the underlying theories behind what we have seen. As a group, we will be looking at the literature through our own research as well as using the literature that was presented in our LFS 350 classes. We are going to comprehend what is being said in our research and linking it to our experiences in the temple and throughout our project. Continuing to use an asset based community development/engagement approach to complete our project. It can be very easy to think in terms of ‘deficits’ within our given project, how we can help the Temple fill a niche role that they may be currently struggling with. However, this is not the goal of our project. In order to foster an understanding and more importantly an appreciation for the Hari Krishna Temple, we need to keep our focus on what the Temple is currently contributing to it’s members and the surrounding community. For example, the provision of karma free food enables members to come together and engage with one another over a culturally appropriate meal that can act as a means to provide food security without racial judgement. By using this assets framework, we will continue to recognize that our community partner has a unique set of talents to contribute to any future project; we as outside academics are not the only people who can apply program implementations in a given community as a means to address large scale food system issues such as food security or food justice (The University of Memphis, 2017). University of Memphis. (2017). Differences in framing community work. Module 4- Asset Based Community Engagement. Retrieved from http://www.memphis.edu/ess/module4/page2.php. This entry was posted in Uncategorized on March 10, 2017 by Sarah Beaver. Little did they know, group 2 would fight between themselves as ideas would clash as ideologies and futures change. True understanding of the research you are conducting comes after you have finished the research but crafting a good proposal requires you to have that understanding before you do the research…. Our goal this week is finalizing a date so we can to participate in the Sunday Feast at the Hare Krishna Temple. Additionally, we are also working on finding a weekly meeting time that works for all members to continue so we can get together and work as a cohesive unit as well as having time to address any uncertainties that may arise. Currently we were unable to craft a concret group proposal with goals that allow us to complete our project objectives. This has caused us to set some time aside for the upcoming week to discuss what our objectives are how to accomplish them. Lastly, we are working on completing our individual thesis statement for the upcoming academic and experiential review papers as a means to further explore food justice in relation to our community project. Our team successfully completed our second blog post, reflecting primarily on how our proposal may be improved. To assist us in this process, some of our group members were able to meet with our TA to ask for clarity and have since shared this information with our group. From this, we have determined that we can enhance our project by narrowing the focus and goals of our proposal. We have also made our first visit to the Hari Krishna Temple (our community partner) and as a team and we have maintained good communication with them. In addition, our attendance in class has been strong which has helped increased opportunities to engage with the course material. While we are collectively still learning how to collaborate and balance the workload, we are achieving what we feel is an acceptable level of team unity. It was difficult to complete our proposal; we found that the theory behind crafting a proposal was fairly straightforward but had difficulties when applying those concepts in practice. While our team was able to meet multiple times for collaboration, we never had all of our team members present. This added an extra challenge to our work as ideas about course expectations or material to be focused on varied among our group and without those conversations happening head on, it’s challenging to tease them out. When we met with Will to discuss our project and gain clarity, we thought we had a very clear idea of what we were going to do. However, after receiving a grade of 68% on the proposal we quickly realized that this was not the case and some re-evaluation was necessary. Well, we are learning. Moreover we are acknowledging the inevitable challenges that arise with teamwork and proposal writing. While we understand the value of excellent proposal writing as a tool in academia, we have not yet fully grasped the applied skill. On the positive side, this experience presents an opportunity for us to appreciate uncertainty and practice working with diversity in preparation for our future careers, even though it can be very intimidating at the same time. In an article written by Phillips (2014), he speaks to how diversity makes us stronger; it isn’t an effortless process to grow collectively, yet the challenges that present can enhance creativity by causing individuals to search for new information and viewpoints. These diverse viewpoints can then translate to better outcomes in decision making and problem solving by prompting groups to consider an entirely different approach, outcome or component that they otherwise may not have (Phillips, 2014). Tim Harford’s TedTalk (2016) also speaks to this difficulty that arises from group work; diverse members often feel like they have achieved less when conflicts of interest arise, yet this friction can actually help make the end product better. Ultimately, the frustrations that arise from interacting with differing ideas can help make our project more creative, comprehensive and effective. Our team is noticing that group work can be incredibly valuable when done right; diversity can enhance a team’s creativity and effective collaboration can increase efficiency. However, when group work focuses too much on the hardships that arise in a negative way, it’s often much slower and sometimes even more frustrating than individual work. Effective collaboration is something we strive to improve on as it is a very valuable skill that we will continue to use as we pursue our future professional endeavors. As we transition into the last third of the semester, the intensity increases with approaching finals and ever accumulating stress. We are faced with both the challenge and opportunity knowing that our time is continually being stretched among many different academic commitments. In the context of multiple demands across the many facets of life, we aspire to do our best. We know that in order to be successful, we need to pull together and gain clarity on our project proposal while also committing time to enhancing our group dynamic. Both goals can support each other, and our team is up for the challenge. We are very excited and grateful for the opportunity to be learning and engaging with the community as a team. We are looking forward to the finalization of our group proposal and for continued opportunities to grow as a group despite being so diverse. Our first priority surrounds the improvement of our proposal and the second on setting up another meeting with our community partner. Once we have accomplished both of these things, we are looking ahead to transitioning toward preparation of our final report, last two blog posts and final presentation. Our plan to achieve our above goals is to ultimately take each progression one step at a time to ensure that we are giving each our full effort. With consistent group meetings and regular transparent communication, our team will continue to excel. Sickness and family events have been challenging for some group members and thus, the team as a whole. It will prove crucial for everyone to come together as a co-cohesive unit, support one another and step up when others are less present to help combat this. Lastly, working alongside our professors and community partner to determine effective strategies to help reach our project goals while also recognizing our own unique skill set will continue to help us come together in the most effective way to reach our intended outcomes. This entry was posted in Uncategorized on February 26, 2017 by Sarah Beaver. Welcome! This enthusiastic group is fresh back from our visit with the Hare Krishna Temple in Burnaby. While at the Temple we met community leaders Bhav and Jaya Govinda. They explained that the focus of the temple is to spread Krishna Consciousness. Which to our teams surprise directly relates to sustainability and global development. Jaya Govinda taught us the temple and its followers practice Bhakti Yoga, the yoga of love and devotion, where the practice and purpose in living is to see everything as love and as the divine and to honor it though devotion particularly through song, writing, dance, and community. In addition to Bhakti Yoga, is Jhana Yoga, the Yoga of wisdom and discernment. Bhav added, one of the core beliefs of Krishna Consciousness is the reason why the world is the way it is is because of our mindsets, in other words, because of our level of consciousness. It is suggested that as ones inner world shifts – including perceptions, values, and beliefs – so do their actions and so does our outer material world (Allen, P. 2008). The Hare Krishna movement is global and has it roots in ancient India over 6000 years ago. More recently key Yogi’s brought the Krishna movement to America in 1965. Our team consists of three Food, Nutrition and Health Majors; Sarah, Alysha and Jaidan. All three are hoping to gain a better understanding of how nutrition relates to health aspects such as sports nutrition, global malnutrition, are affordable meal access. Kentaro, a Food Market Analysis student, has a post undergraduate goal of solving tuna over fishing caused by current farm fishing practices. The last two team members, Marcus and Timerlane, bring forward a Global Resource Systems perspective that considers how to engage people in issues of our present day in context to their own personal interests and seek to answer the bigger questions such as “how we create environments and systems which bring out the best in people.” As suggested by Phillips, K. W (2014), this beautiful diversity in our group is one of our many assets. As a group, we have common goals and interests. We wish to open our mind to ideas and ways of being that we have never considered before. We are excited to challenge our assumptions and to support each other through the growth in this project. We each have our own unique curiosity around spirituality and we connect in knowing food is part of the essence of life which makes our bodies and world work. One of our main common interests is how culture plays a role in food choices and how different groups use food to express their spiritual beliefs. Moreover, how do faith practices influence community and the greater food system and effectively is the Krishna movement inspiring sustainability and food justice. We are interested in what the assets of the organization are, and in which way we will be able to support them. We are looking forward to exposure to Indian cooking and meal preparation for large groups. In our first visit we felt very warm and welcomed, while afterwords we found yourself wondering if the Vancouver community perceives the Hare Krishna Temple as a welcoming place or more of a cult? Lots of questions to answer. Above all we look forward to this opportunity to connect, contribute, and grow with each other and our community partner. Our team was largely drawn to the Hare Krishna Temple because of the intersections of faith, culture, and food. 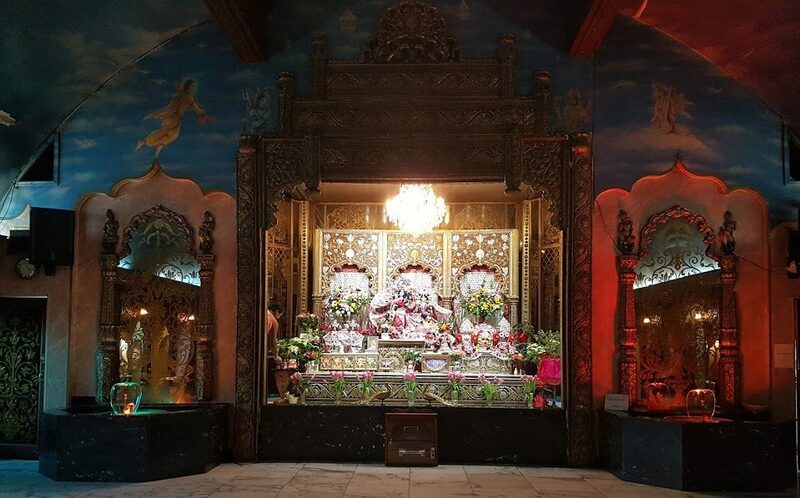 Thus we were amazed to find out The Hare Krishna Temple is part of a global network of communities gathered around service to the world and Bhakti Yoga – the yoga of love, devotion, and relation. AND food and by extension sustainability and development is central to their mission: food is life, and life is food. The Krishna consciousness belief is that everything is sacred and that our economic, environmental, political, spiritual, communal, and social systems must support this sacredness. Some of the ways Hare Krishna Temples reach their aims are with the provision of regular free healthy vegetarian meals as well as a safe place to connect, pray, worship, sing, dance, love, rest through individuals own unique expression. Focusing on the assets of the Temple was eye opening (Mathie, A., & Cunningham, G. (2003), as we learned the temple is a center-piece of culture and faith for this community. Jaya Govinda informed us that the temples are not only involved locally with vegetarian meal provision, but also has acts as part of an international system. The organization is part of “eco villages” scattered throughout the globe that focus on sustainable, good karma food production methods. In addition to this, the Hare Krishna temple based in Vancouver also has rural farms towards the interior of BC that seek to provide cow protection zones and utilizes organic farming techniques to grow a wide variety of produce. Our team was surprised to learn that this temple has its origins intertwined with the 1970’s mentality of simplicity and harmless diets for the planet and for animals. However this has inspired one of our goals for the end of the project. If it is also seen valuable by our community partner, we are interested in supporting the development of the Hare Krishna Temples community garden throughout the spring months. Other ideas brought to life from our interactions at the Hare Krishna Temple and in Lecture with Will Valleys LFS 350 course include articulating how regional food system policy interacts with public food assets in order to promote a healthy, sustainable and just food system. We look forward to conducting an institutional case study and communicating these results back to the general public. We aspire to effectively describe the breadth of an institution/organization and how they contribute to the community food system and more importantly how food contributes to organizational objectives. Our ideas our copious. Though we will have to focus – and our proposal is helping us do so – we would also like to figure out what kinds of foods are the most appealing to the community and how the Hare Krishna food plan at the temple could improve in the coming years. We could also navigate a way using questionnaire or surveys to improve the waste efficient and public opinion of the Hare Krishna Temple. Our first impressions of the project have been great. We are a cohesive group that is open to embracing the asset based development approach while exploring justice, faith, and culture in our community based learning system. We are a smart and hardworking team who has enough common interest for collaboration and enough uniqueness to give us a special spark. Our team carries with us the passion and experience from Ernesto Sirolli’s TED Talk where he draws on the significance of focusing on assets and on letting the community partner speak – while we listen – to build trust, integrity, and authenticity. For any project to be truly successful it’s key for all parties involved to brainstorm approaches, resources, criteria etc. in order to actually find the most context specific strategies (McCullum et al, 2005). For instance, by asking the temple what they think needs to happen and what resources they already have together we can co-create an effective plan to implement together that will actually benefit the community members instead of just doing what we perceive to be needed. Connecting that to the temple, it is incredibly powerful to have community. Krishna Consciousness is inherently asset based, it believes we are whole, beautiful, peaceful, loving, sacred, and divine. The movement strives to bring the best out of people starting with what people have, and building around food, community, place, spirit, love, song, story, and dance. The justice aspect functions on the principle that everyone is equal and our journey on earth has much more to do with what is happening inside in our hearts than it does on our outsides. We need to be cohesive as a group to do well in this project, just like the temple we are researching and learning from needs to be a cohesive community in order to function optimally. McCullum, C., Desjardins, E., Kraak, V. I., Ladipo, P., & Costello, H. (2005). Evidence-based strategies to build community food security. Journal of the American Dietetic Association, 105(2), 278–283. This entry was posted in Uncategorized on January 27, 2017 by Sarah Beaver.